Some times it is just necessary to go fishing. 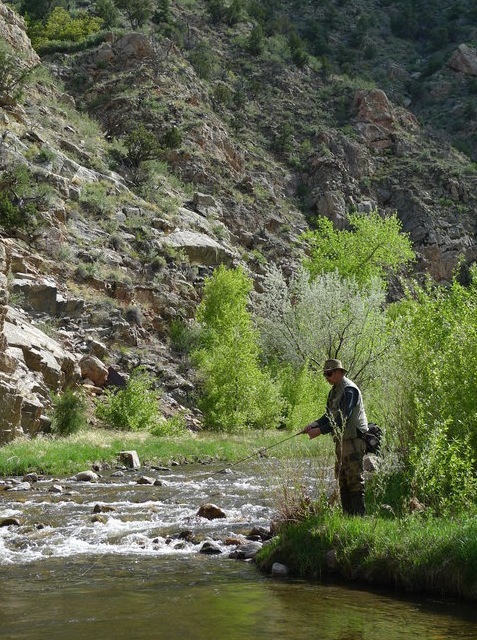 A slow spring run-off this year is helping keep spring streams in southern Colorado fishable. Thanks to Sawtooth (who needs to blog more) for getting me out of the house. This is Grape Creek, which flows from the Wet Mountain Valley into the Arkansas River at Cañon City. It was Zebulon Pike's route up into the valley in 1807, which must have been a miserable trip. I wonder what its canyon looked like then. We caught brown and rainbow trout—and saw one battered two-foot-long tiger muskie, which must have washed down from Lake DeWeese. Out of its habitat, away from its prey base, its prospects were not good at all. Zeb would have eaten it, had tiger muskies existed two hundred years ago. So would I, but I had no net to try to grab it with, and I could not interest it in a streamer fly. I fished the Arkansas at Spikebuck on Tuesday myself. It was OK. Wind not unreasonable, but yes, nymphs were the ticket.